For the last day of Gradiance Week (which was really just five days, but whatevs) I decided to go out with a bang! 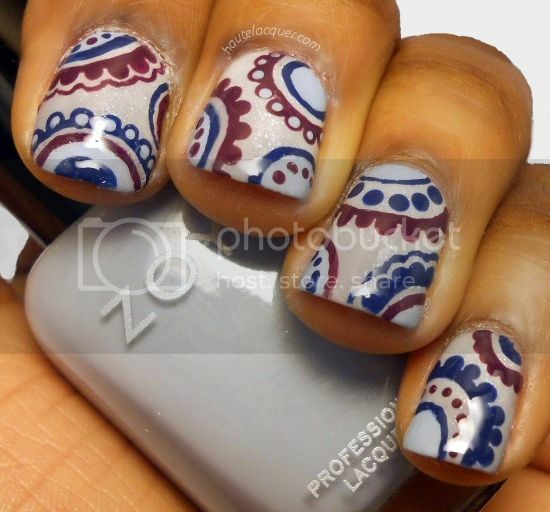 Remember my Abstract Paisley design from this summer? 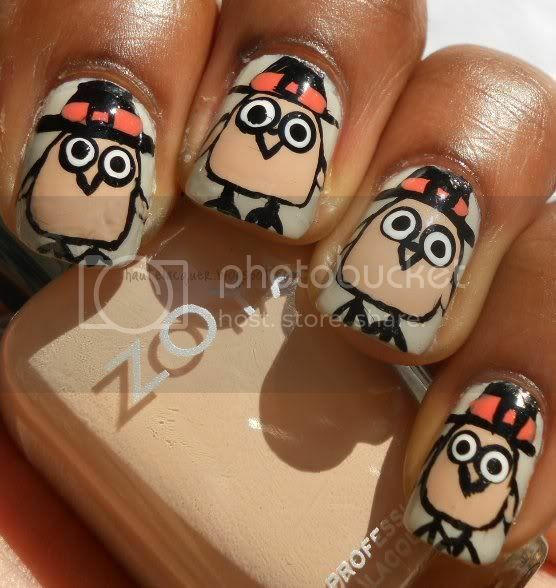 Well I took inspiration from that manicure and put it into this one. I showed my sister this manicure after doing just one finger and she immediately recognized where it came from! How funny is that? For this manicure I used Zoya Carey as the blue-ish gray base. I sponged on Wet N Wild Break the Ice on the upper portion of the nail (which isn't too obvious in these pics). Then I created all the details with a nail art brush and the following polishes: China Glaze First Mate (love, love, love this polish SO much! ), Zoya Monica, and Zoya Kristen. For Day 4 of Gradiance Week I'm sharing this design that I quickly created. I was trying to get into the "fall mood" with more fall toned colors, I think I succeeded! These colors remind me of the desert, the sand especially. I don't know, that's all I think of when I see this design! 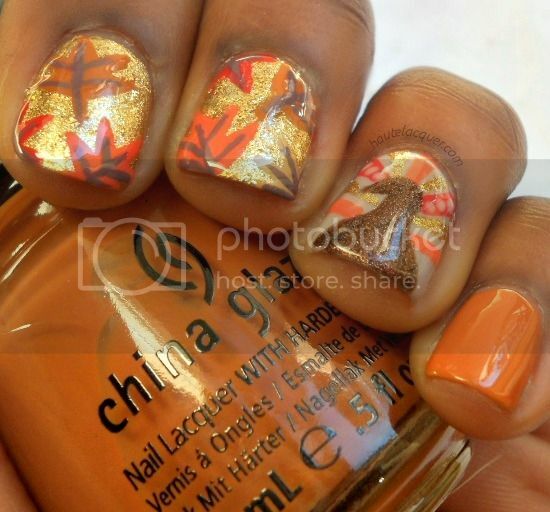 For this manicure I used China Glaze Below Deck as the base. 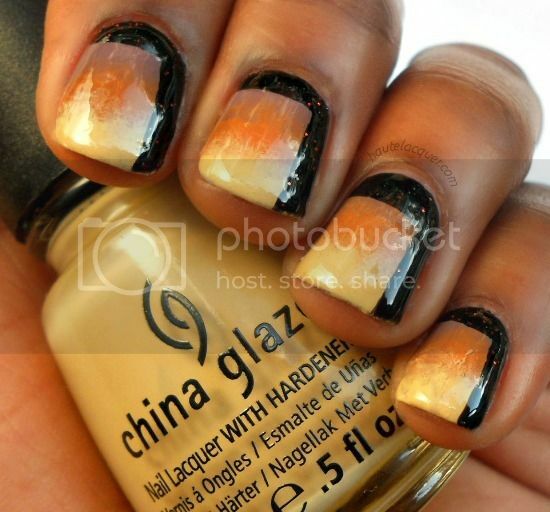 I created the gradient effect with a sponge, China Glaze Desert Sun, and China Glaze Kalahari Kiss. Then I took my nail art brush and Essence Grand-Plié in Black created the "square" shape. You could also use tape and only tape off the squares. I finished off with top coat to blend the gradient and leave a glossy shine. So that's it! 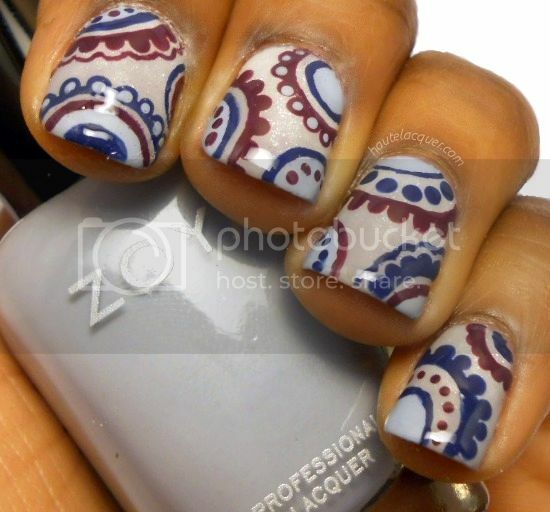 This is one of those manicures that anyone could do, even if you mess up it's easy to go back and fix those errors. Welcome to Day 3 of Gradiance Week! Yesterday's design was the epitome of summer, so of course I had to use more fall-ish colors for today's design! 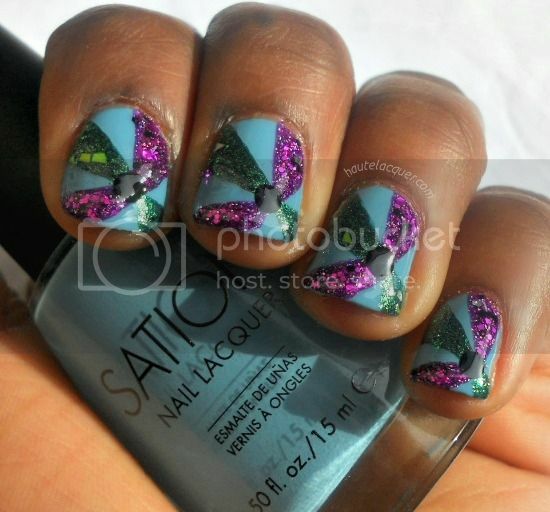 Today's design is inspired by a design of Sarah's (Chalkboard Nails) that I instantly fell in love with! I've had it bookmarked in my mind for a while now. The only difference between hers and mine is that I chose to do a gradient along with stripes, I also opted out of tape. For this manicure I used China Glaze First Mate as the navy blue base. 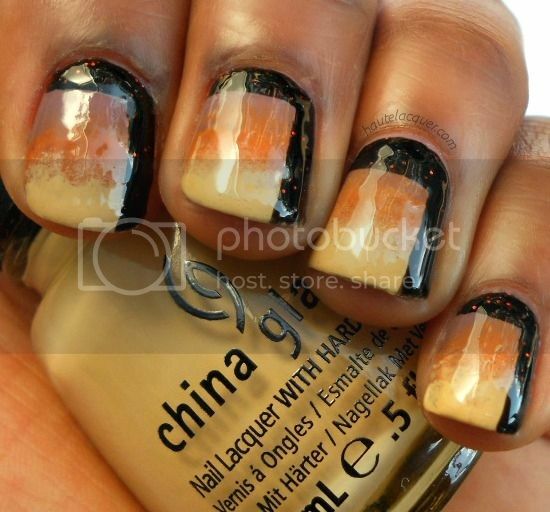 Using a sponge, I created the gradient of China Glaze Exotic Encounters and China Glaze Sea Spray. 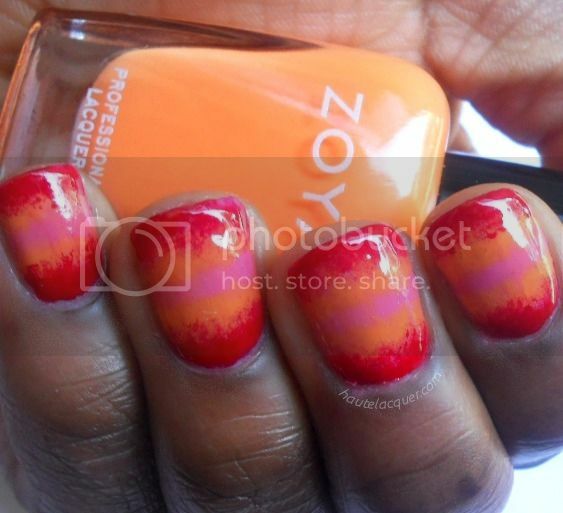 Taking my nail art brush I created stripes going across the entire nail with Zoya Evvie. The panels of black were created with a black polish and nail art brush. You could use tape for the last two steps but I chose not to. This is by far my favorite gradient color combo, la la love! Welcome to Day 2 of Gradiance Week! 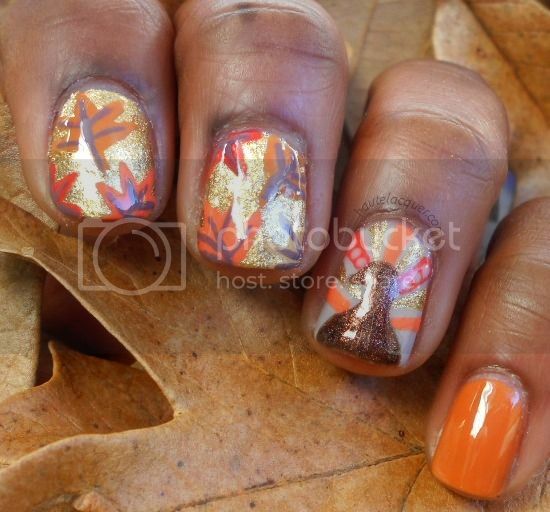 Now I know we're in the middle of fall but I couldn't resist this manicure. It's so summery, bright, and refreshing! I'm just one of those people...I don't care what season it is, my nails will be whatever color, whenever. I'm not alone on this am I? 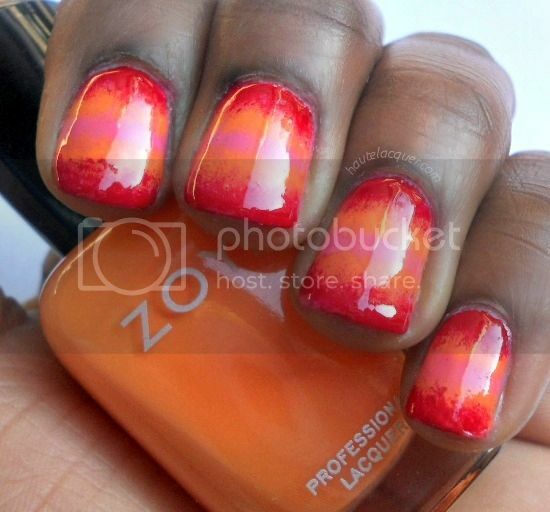 For this manicure I used Wet N Wild Heatwave as the red base. 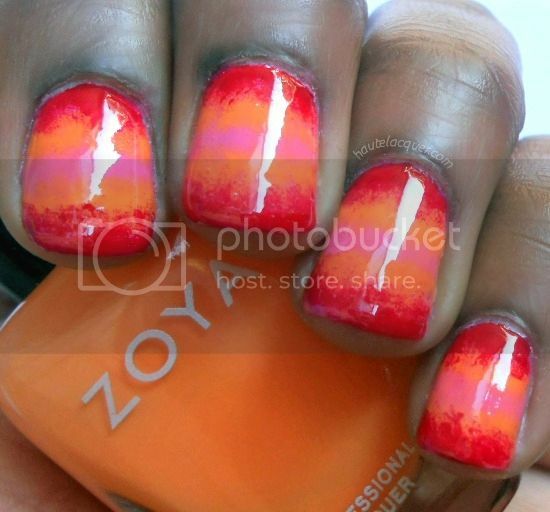 Then I sponged on Zoya Arizona on the center of the nail. 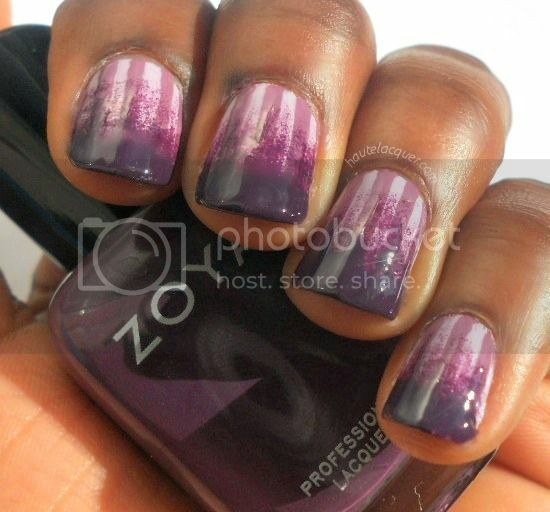 Lastly I sponged on Zoya Shelby to the very center of the nail. It almost looks like a pink stripe in these pictures but it is sponged on! I let it dry, hm...let's say 50%, then added a topcoat. Super bright, super crazy, just perfect. Anyone going out/went out shopping today? I'm more of a low key, pajama loving, online shopping kind of girl. Cyber Monday, now that's what I'm excited for! Today's design is long overdo. I've been wanting to recreate this manicure from a post I did two summers ago but just now got around to doing it. I'm also starting a new series, about a week long, called "Gradiance", the word gradient and radiance combined. I've been loving gradients so much lately, so why not? 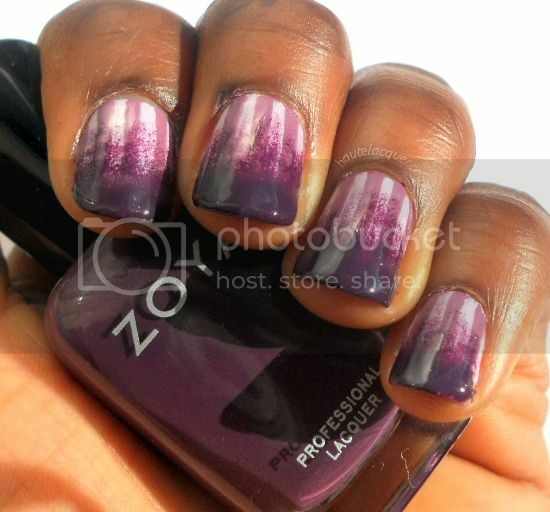 For this manicure I used Zoya Marley as the light purple base. Then I freehanded the stripes (which I do for most of my stripe designs) but you could use striping tape or regular scotch tape (just cut to desired size). I used Wet N Wild Bite The Bullet for the stripes. 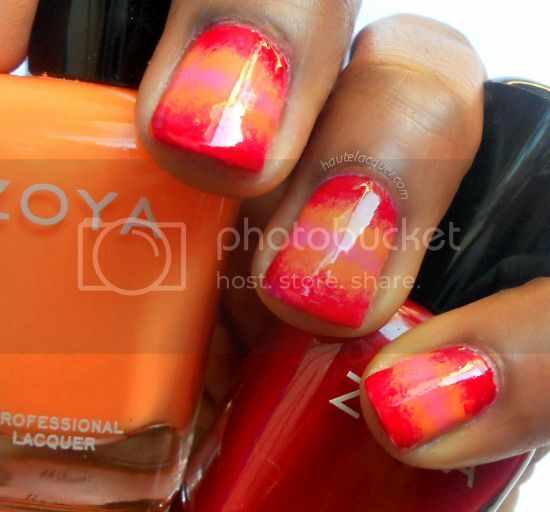 Lastly, I sponged on Zoya Monica (which is stunning). I finished off with top coat. That's it! Easy as pie. Speaking of pie, how was your Thanksgiving? Dazzling Feast | Happy Turkey Day! What are you thankful for this year? Every year my response is the same: family, friends, or my health, but this year I'm changing it up! 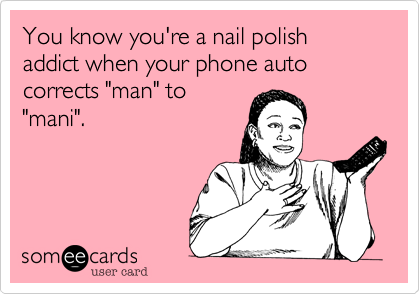 I'm thankful for the internet, which has opened my eyes to this world of nail polish and nail art, a nice escape from my day to day life. I've gained some really great friends and amazing readers all thanks to the internet. 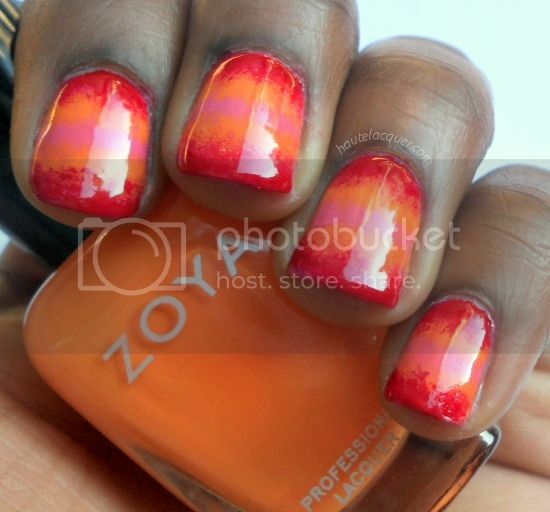 For this manicure I used Zoya Ziv (index and middle), Sation Free-Dom (ring), and China Glaze Desert Sun (pinky) as the bases. This manicure has a lot going on so I will break it down for you...Index & Middle fingers: Using a nail art brush I took China Glaze Desert Sun (caramel orange), Wet N Wild Club Havana (orange), Sation 3 Free-Dom (taupe), and Wet N Wild Heatwave (red) for the leaves. 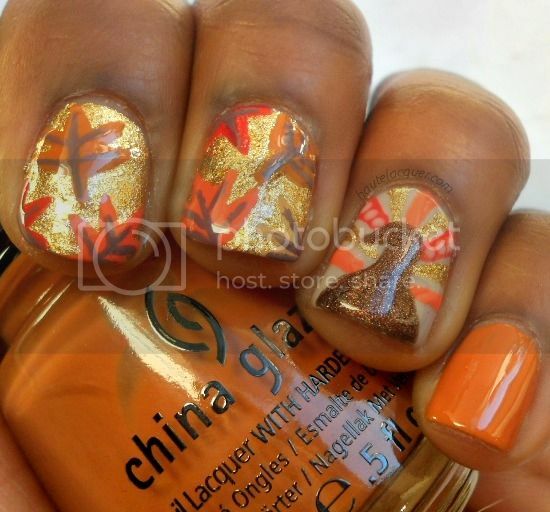 I drew the leaf details in China Glaze Below Deck. Ring finger: I first drew the feathers of the turkey with the same colors as I used for the index & middle fingers' leaves. Afterwards I added dots on the red feathers using Sation Free- Dom. The body of the bird was made using Diamond Cosmetics Decadence. 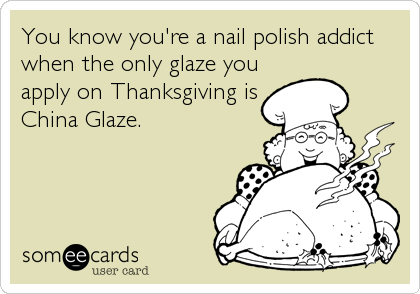 Check out my Thanksgiving manicure from last year, click the picture below! So what unique thing(s) are you thankful for this Thanksgiving? Tell me in the comments below! P.S. 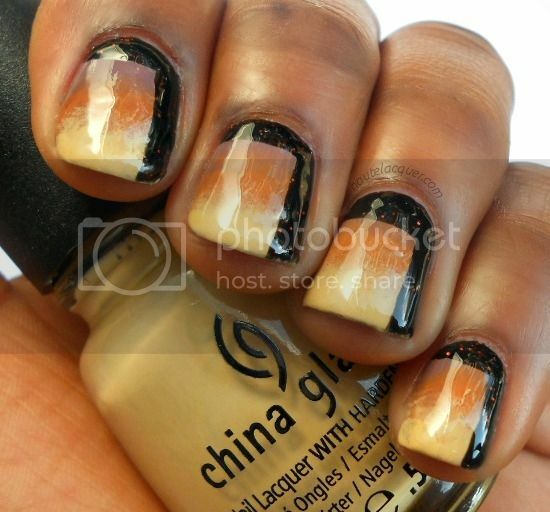 Check out the brand new Haute Lacquer Pinterest Gallery! I actually did today's manicure while I was eating breakfast,yes I know...multi-tasking at it's finest. I've already done a Thanksgiving design (which you'll see either Wed or Thurs) for you guys, it's pretty detailed and time consuming so to offset that I want to post more simple designs throughout the week. This literally took no time at all and was really fun to create! 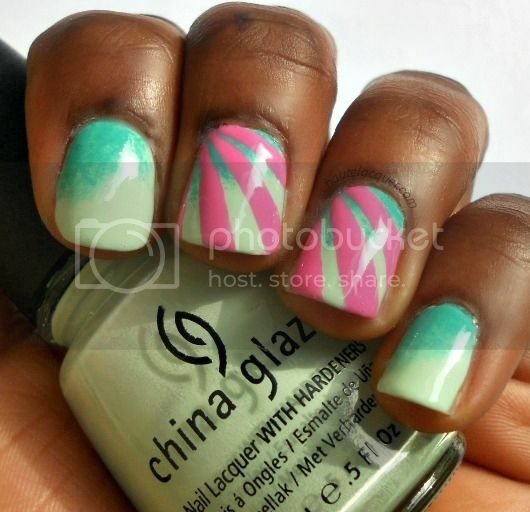 For this manicure I used China Glaze Re-fresh Mint as the pretty mint base. Then I took a sponge and sponged on Barielle Do Unto Others, diagonally, coming from the top left corner of my nail (closest to my cuticle). For the accent fingers I took my nail art brush and Zoya Shelby (my favorite pink!) and created stripes that extend from the top left corner of my nail to the bottom right corner. You'll notice that the stripes get larger as they reach the bottom, this is what creates that "bursting" effect. As always, I finished off with top coat! This is a fun, cute, and simple design that would be great for nail art beginners or even if you've been doing nail art for years. 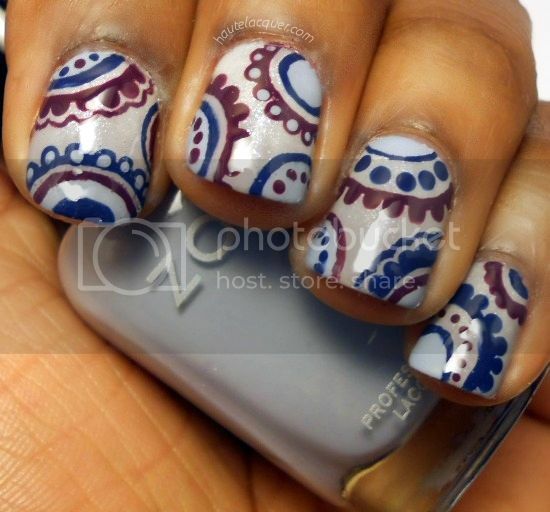 Be sure to let me know if you try this design, or any of my designs, out; email it to me or post it on my Facebook! Vivid Stripes + How to Make Your Manicure Last! As most of you already know, I am a monthly contributor to the gorgeous Ro's blog, Creatively Yours. This month's post features this bright striped design and some simple tips on how to make your manicure last! With these tips, I can usually go five days without chips or tip wear. 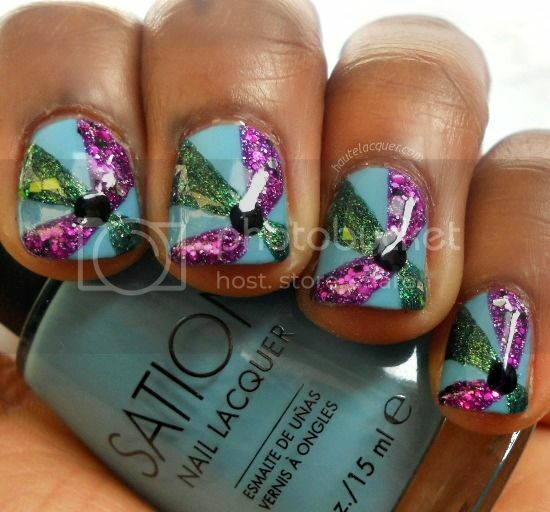 If you've had trouble stretching your manicure or you just want to try this design, you'll want to read my guest post! 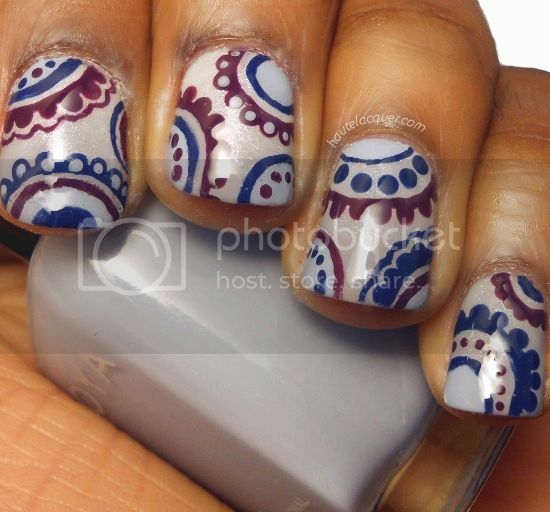 To find out more about this manicure and for a quick walk through of how to achieve this design, check out my guest post on Creatively Yours. 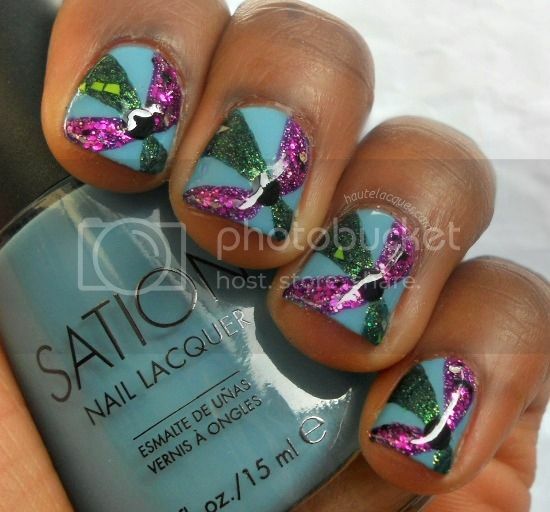 This is part two of the Sation manicures/reviews! The holidays are right around the corner so what better way to prepare then with a holiday manicure? I apologize for the lighting being so "off" in these pictures, I was battling with the sun all day! For this manicure I used Sation 3 Free-Dom as the taupe base. Next, using a nail art brush, I created the outline of all the leopard spots using Sation I Paint in Peace. I used the same brush to fill in the spots with Zoya Ziv, then I went over the spots with Sation No Rings Attached. The accent finger (the ring finger) was created with a chevron print inspiration. 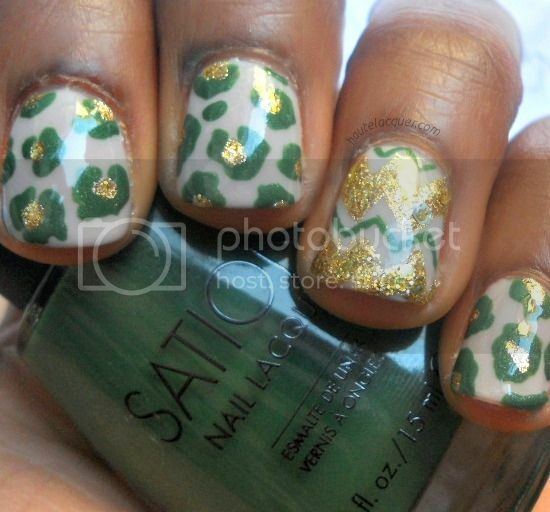 I used Zoya Ziv and Sation NRA once again for the gold and Sation I Paint in Peace for the thin green chevron. As always, I finished with a top coat. Today's post is a design I created with Sation's recent collections, I Love Miss-self (Midlife Miss-tress and Ego Friendly) and Little Horse On The Prairie (Blue Sky's the Limit). I’d been wanting to do a pinwheel design for over a year so it's about time I finally get to it! For this manicure I used Sation Blue Sky's the Limit for the blue base. 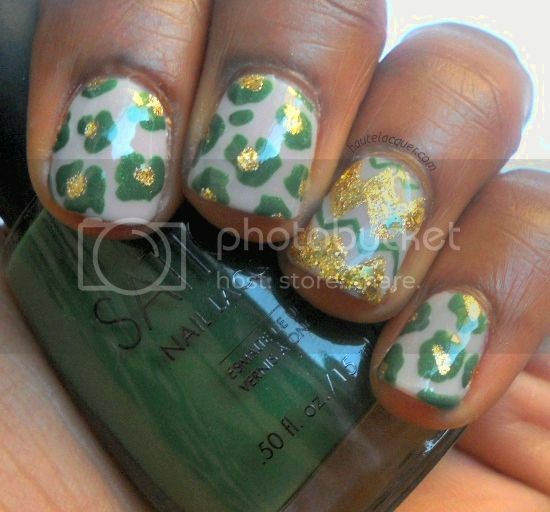 I then took a nail art brush and Zoya Logan to create the green pinwheel and Zoya Aurora. I alternated stripes with the two colors using this tutorial on Youtube as a guide. Afterwards I went over the stripes with the following coordinating glitters... Sation Midlife Miss-tress (purple) and Sation Ego Friendly (green). Lastly, I took my dotting tool and with the large end created the black dots in the middle. I finished with a shiny top coat. You can never go wrong with glitter, I love the effect they gave in this manicure! What do you think? I've decided to start a new series on my blog! As you all know, I don't always have time to do my nails and make a post due to school but I want to still post something. 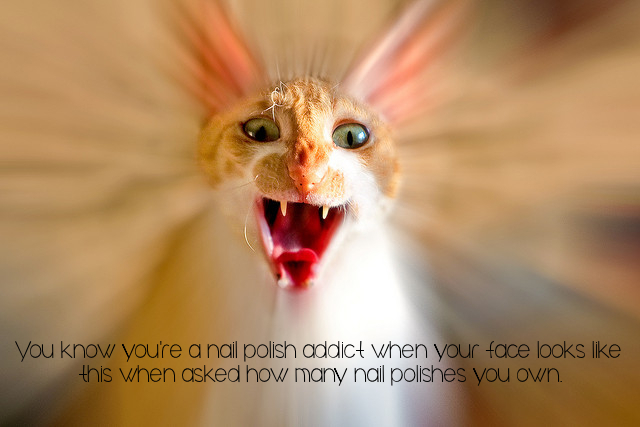 And from now on every Saturday or every other Saturday I'll be posting a "You're a Nail Polish Addict" post/image right here on Haute Lacquer"! Have a cute saying/joke you want me to use for my next YANPA post? Email me at hautelacquer(at)gmail(dot)com and let me know! Bird Silhouettes + New Blog Design! Have you noticed Haute Lacquer's new blog layout/design?! This blog was long overdo for a makeover. I love the fresh, clean look it has now! I wanted something simple but could never find anything I liked online so I just went for it and did it all on my own, well besides the thousands of tutorials I had to use. If you're wondering how I did any specific thing just let me know in the comments. So today's design is something I've wanted to do for a while, I just love bird silhouettes, this probably won't be the last design I do with them. And I promise this design doesn't look as messy in real life! For this manicure I used OPI Skulls and Glossbones as the base. I then randomly sponged on Revlon Waterfall, Zoya Shelby and Zoya Breezi. 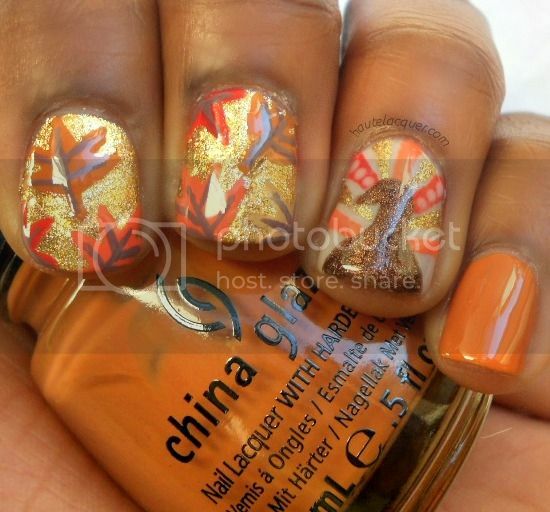 Afterwards I drew the branches that the birds are sitting on using black and a nail art brush, I added leaves as well. 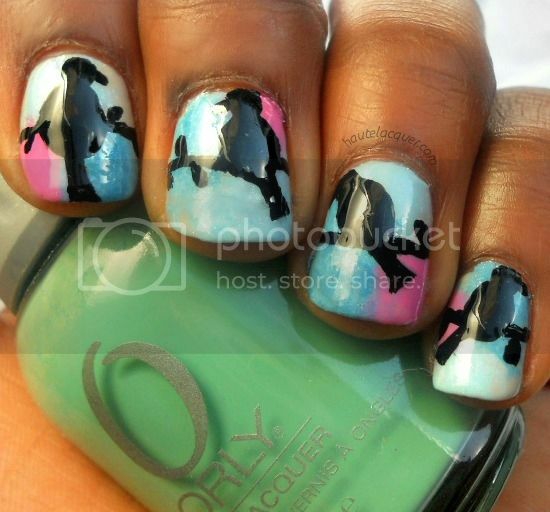 Then came the bird, I just googled "bird silhouettes" and drew the birds carefully on my nails. I finished with a top coat. By the way, I'm holding a random bottle in these pictures, I didn't use this in the manicure!